This research aims to explain all the processes related to mobility programs for students and also present some different projects that are currently being developed in Europe to transform administrative procedures to make them easier. 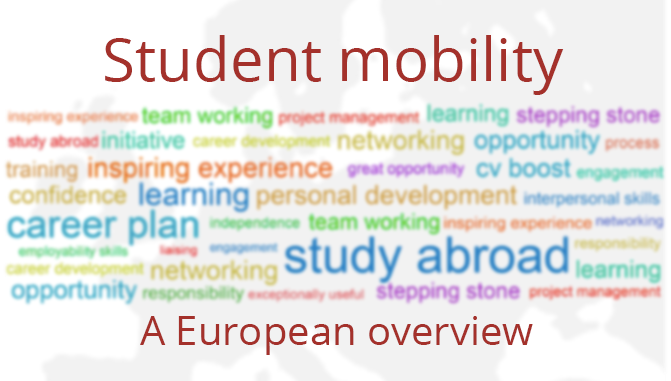 Even though there are many exchange pro-grams in which students can take part, this research will focus on all the mobility processes involved in the Erasmus program only. This responds to two basic reasons: on the one hand, the Erasmus program is the one with the greatest number of participants in Europe; on the other hand, it uses a standard procedure of activities related to the administrative processes which is independent from the home or host universities that take part in the program. The Erasmus Project began to work 30 years ago just as an international mobility project for 3.244 EU student from 11 countries (Belgium, Denmark, Germany, Greece, Fran-ce, Ireland, Italy, the Netherlands, Portugal, Spain and the UK), numbers that now seem irrelevant compared to its actual dimensions. The program was focused only to pro-mote international mobility among university students. Nevertheless, three decades later, the current program is a lot more than what it was when it took off. Now it is not only focused on student’s mobility. Instead, it has expanded itself to offer a wider range of academic and working opportunities. For instance, the project now includes internships and traineeships, training programs for teachers and institutional workers, international cooperation between universities, research projects, etc. What is most significant about the administrative processes of mobility programs is the great amount of in-formation and data which is exchanged between higher education institutions. These procedures involve the management of very different kind of data and information and, in many occasions, host a diverse kind of regulations, such as different gradation systems, different academic and administrative calendars, etc. Hence, given the facts, these processes are always complex and imply many efforts from administrative staff and students. This happens because the procedures are based on an exchange of documents and information which the student must take care of completely on their own so they can take part in the mobility program. These documents need to be handed in physically in both home and host universities and a lot of information must be exchanged between the administrative staff of higher education institutions. The present paper, therefore, will explain in detail all the procedures included in the Erasmus mobility program, the processes students must go through, what documents and management they must take care of and also all the different administrative steps. Also, this paper includes the new initiatives that are currently taking place and which are designed to improve all aspects relating to the management and administration of the mobility processes. In the end, their main goal is to make them easier in order to simplify the exchange of information between higher education institutions. As a conclusion, all the unsolved aspects about the management procedures which are not being worked on will be specified. The research and work by the RS3G group has been taken as a reference for the research presented in this paper. This group started to work with the aim to promote, develop and adopt standard systems of exchange of data and information between institutions. Some of the projects that are being carried out now are based on the previous work made by the RS3G group. The Erasmus Program started in 1987 and nowadays, in 2017, it has reached its 30th anniversary. The project has evolved extraordinarily since it began to run 30 years ago and, because of its success, it is now considered the most famous and popular European Union program among the citizens and countries that all together run the project. It is also the program in Europe which enjoys the greatest consensus on why it matters socially, culturally and politically and has more people backing its existence. It all began with a very simple idea: implementing and translating the core European values and ideals into an international educational program to develop a mobility program for students from all Europe. The main goal was giving a new perspective of Europe to understand it as a place in which one could live, work, travel, retire and develop any economic and social activity for a lifetime. The program started with 11 countries and 3.244 students. Now, however, the figures show a very different reality. In 2015, 33 countries took part in the Erasmus+ project and more than 678.000 people were registered to take part in an Erasmus exchange: half of them were students (347.100 students) and the rest were registered as internships and traineeships, teacher training programs, volunteers, etc. Besides, more than 69.000 organizations and entities were involved in all of them and about 19.600 academic, research and working projects were developed. The evolution of the Erasmus Program during all these years has been truly extraordinary. The program owes its success to a diverse number of reasons which usually make the experience fully profitable and beneficial for the students and all its participants: the flexibility offered in the exchange programs, the opportunity to meet other students taking part in an Erasmus exchange, studying and living in a different country, with a very different educational system and with a totally different culture and lifestyle, are some of the key factors and elements which result attractive to the students and other participants. Actually, surveys and statistics proof that when students and participants were asked, 96% of them claimed to be very satisfied with their Erasmus experience. Another great majority also confirm that they would do it again and also would recommend other students to take part in an Erasmus exchange. They also declare to feel more European and have a greater sense of belonging to the European community once they finish their period abroad. Until today, 9 million people have taken part in an Erasmus exchange and the program is only expected to keep growing in numbers. Every year, more and more students want to take the chance to have an Erasmus experience and, on top of the impact it has in their personal lives, the statistics and figures obtained on a macroeconomic and social level are also very impressive and positive. Higher Education Institutions create a mobility framework of students, teaching staff and administrative staff when building mobility projects and reaching agreements for exchange programs. The management of the processes involved in this mobility framework generates a great amount of shared in-formation and data between institutions that is exchanged by the administrative staff and students. The great majority of European universities use a Student Information System (SIS) that generates students’ data digitally. However, the exchange of data between institutions still involves a lot of physical paperwork, which makes the process more complicated because information is duplicated and the procedures are slower, as they require the physical presence of the student to hand in the necessary documents to the administration. One of the more frequents complaints made by students is always about the administrative and bureaucratic processes they have to deal with in order to be able to go on an exchange: motivation letters, recommendation letters, the transfer of their academic expedient, the recognition and validation of their coursed credits and the academic content, the validation of their academic results and grades and stay in a university abroad, the approval of their Learning Agreement, etc. All these administrative processes make it very difficult for the student to simplify their exchange program in terms of its administrative management. The main problems are not only about the processes, but also about the lack of on-line transferring of academic data between universities and other institutions involved in all those processes. What is more relevant is that these are not minor problems for the student taking part in an exchange program, as any mistakes made on these processes can result in a lack of validation or nullity of their exchange program, Learning Agreement or academic results obtained abroad. For instance, 71% of the students that take on a mobility program claim that they must change or modify their Learning Agreement (which should be signed and ratified before their academic experience abroad starts) because the courses or subjects they applied for initially become unavailable to them once they find themselves in their host universities abroad. Besides, only 62% of students confirm that they get an unconditional and official validation of all the credits coursed abroad although they were all approved initially by their Learning Agreements. Modifications on Learning Agreements, which occur frequently, often become the main reason why the credits coursed and obtained abroad are not valid back home when re-turning to their home university. The resolution of these merely administrative problems as well as the transfer of their academic and personal data and information required by universities, are always in charge of the exchange student. The student that is willing to take part in a mobility pro-gram has to manage and deal with different administrative procedures and the gathering of many documents which need to be presented to both home and host universities. The first thing that a student who wants to go on an ex-change must do is notifying their home universities. They need to fill in an application form to inform about their will to go abroad by applying to one or more possible future host universities offered by their home university. Once this first step is reached, the host university will accept or reject their petition depending on whether their application matches some requirements imposed by the host institution itself. If the petition is rejected, the student can try to apply again to amend the previous mistakes which prevent the student from correctly applying for an exchange program. If the application is correct in the first place, the student must wait until the assignation of vacancies of the host universities takes place. In the assignation process, the home institution allocates each student to one of the universities for which the student has applied in the first place. The designation of these vacancies is made according to an assignation criteria designed and established by the home institution itself. Therefore, the student may or may not be assigned a place in one of the universities they applied for in the end. If the student is denied the exchange program they applied for in the beginning because they cannot be allocated in the applying universities, they can wait to be reallocated in a second assignation process which may be taken in the short future. If the student is assigned a place to one of the universities they applied for instead, the student now is prepared to move on to the next step: accepting the assigned vacancy or rejecting it, which they can always do until the very last moment. Right in the moment when the Learning Agreement has been made, the student is ready to go and begin with their Erasmus Experience. And once they get to their host university, the student must notify their home university by sending a Certificate of Arrival, signed and sealed by the host institution. On top of all these processes, European students can also apply for grants and scholarship to regional, national or European academic funds to obtain some economic support during their exchange. This last step before going abroad is optional and requires producing more documents and administrative procedures. Once the acceptance is made, the student then proceeds to take an OLS (Online Linguistic Support) test, which consists of an examination of their knowledge and linguistic skills of the language used in their host university. Finally, when the student is officially accepted by the host university, then they must choose which courses or subjects they would like to take on while studying abroad and obtain afterwards an official validation of these choices by both the home and host universities by signing a Learning Agreement. With this document, the student gets an official recognition of the credits they study abroad and can validate and include them on their academic expedient once their exchange program ends and they go back home. The host university, right in the moment they know that they will be receiving a foreign student, may ask them some documents: motivation letters, recommendation letters, official idiom certificates, the academic expedient, etc. Some of these documents can be obtained by asking to the home university and some others may be gathered by the student themselves. When the student validates the application form of their exchange program, all administrative processes dependent on the host university begin. The first step is enrolling to the host university. Afterwards, the student proceeds to choose and register to different courses or subjects they want to study while abroad, only if they have had their Learning Agreement approved by both universities before. During their mobility period, the student will be subject to the administration of the host university and, once the Erasmus experience ends, they will have to prove their stay abroad by presenting a Certificate of Departure. The student must submit their academic results obtained in their host university too in order to validate and transfer them to their academic expedient. And finally, they must retake another OLS test to examine their linguistic improvement on the foreign language in which they have been studying while abroad. WHAT ARE THE CURRENT PROJECTS IN EUROPE THAT AIM TO IMPROVE THE MOBILITY PROGRAMS? The obstacles with which students struggle to manage their administrative processes during their period of exchange have triggered the creation of many initiatives that are trying to cover the unsolved aspects of the-se processes. The platforms which have presented the best proposals are EMREX, ERASMUS WITHOUT PAPERS (EWP) and ON-LINE LEARNING AGREEMENT (OLA). These three platforms are supported by businesses, entities, organizations and educational institutions which want to promote these platforms to get real solutions. Their goals are, on the one hand, getting rid of the great amount of physical paperwork and documents which are required to students during all their period on exchange by digitally transferring all data and information and producing all registrations digitally as well. On the other hand, their main goal also is to allow students and universities to gene-rate their Learning Agreements on-line. In the end, the-se initiatives are proposals to simplify the administrative processes of the exchange programs to students and the administration, now that technology can make it possible and is really a necessity for everyone involved in all procedures. It is important to mention that all three proposals mentioned above provide safer and more private solutions than the ones offered by electronic or ordinary mail. All connections are encrypted through digital certificates so that all data and information are always protected. Information about the agreement between institutions. The application form from the student that takes part in the mobility programme. A list of the students assigned with a vacancy in a host university. The Learning Agreement (including the course catalogue). Certificate of Academic Results (TOR). Certificates of Arrival and Departure. All institutions involved in the EWP project should register themselves to its digital platform so that other institutions can find them on the platform. Once they are able to identify each other, the exchange of information can take place. This project is thought to provide institutions with a platform which they can use every day to exchange information without needing to add any other platform or different system. EMREX is a project that offers a common system for European universities to provide students with a platform on which they can ask themselves for the academic results obtained abroad. This allows students to obtain the information they need and transfer them automatically to their home university while ensuring their privacy and safety during the whole process, without depending on the institutional administration to do that for them. The platform provides an automatic tool which simplifies and accelerates the procedure, making it a more efficient and autonomous process. After all, the platform gives a unique solution for students in order to have an easier access to the information they want, whenever and wherever they want, speeding everything up the to transfer their grades into their academic expedient so that they can get as fast as possible an official validation of the academic results obtained abroad. Besides, all collected data will be available to be used for statistical programs and collect more information about mobility projects. The OLA (On-line Learning Agreement) project suggests a specified solution for the Learning Agreements that need to be made between universities and students. OLA provides an on-line platform to digitalize the agreement, allowing it to be generated, regenerated, updated, signed and ratified on-line and electronically. This way, the process becomes more flexible and gives a very simple solution to the possible modifications that a student’s Learning Agreement may suffer, which occur very frequently due to changes in the course catalogue of universities. This platform offers a solution to a very important aspect for exchange students, as it does not only simplify the process, but it also allows them to make changes and modify their Learning Agreements easier when necessary. When changes to study plans occur, and are not notified to universities, these do not get registered in their Learning Agreements. Hence, the validation and official recognition of their stay abroad and academic results may be put in danger. Matching the study plan with the Learning Agreement is indispensable to get the final approval and official validation of any student’s stay in the host university. The most recurrent problem in managing mobility programs is about the confection of the Learning Agreements. Producing them requires informing students about the available courses that the host universities offer to exchange programs first. The real problem lies on the selection of the courses that students make in order to develop the study plan they would like to follow while abroad. This selection needs to be approved so that their Learning Agreement is signed and ratified by universities but, once they get to their host universities, a high percentage of students find themselves in a situation that obliges them to modify the Learning Agreement which has already been approved. This happens because the courses they previously selected to take part in are not available any more, or are not offered to exchange students, or maybe are already full or maybe do not match with the studies for which the student applied for. Changes on the selection of the courses imply an immediate modification of the Learning Agreement, which needs to be sent again to the home university and get approved by both universities so that when the academic results come in, they can be officially validated. A potential improvement of the process could be made by providing updated course catalogues to exchange students with information about their availability, their content and an academic schedule. All this information could simplify the management and arrangement of the Learning Agreement and could reduce the number of modifications that currently need to be made. 8.2.Conversion of the grading system and academic results. Obtaining the academic results and transferring them to the academic expedient are key processes to get a final approval of the exchange program by the home university. A major problem appears when the academic results from the host universities have to be transferred to the academic expedient of the home university and the grading systems need to be converted. Currently, this process is made manually taking the certificate of results given by the host university as a reference. The EWP and EMREX project both give a solution to allow the digital exchange of this certificate but do not convert the results form one grading system to the other one automatically. A great improvement would be to achieve this conversion to be made automatically. Although there is a European project – EGRACONS – that provides a platform to make this conversion, the platform is designed to produce this conversion and not to be integrated in a system which could generate it automatically. Some of the projects that are being developed are focused on the autonomous capacity of the student to carry out some of the administrative processes, such as obtaining the academic results or confectioning the Learning Agreement. In these cases, these procedures require the student to register themselves in the systems to have a virtual identification. The process of digital authentication should be provided by the home university and the platforms should allow the system to integrate a sole identification process of the user (the student) to avoid double authentications in the systems. An integrated system of identification could improve exponentially the transfer of information made in mobility programs, as it would only be necessary for students to authenticate in one system and could provide better safety and privacy measures so that it could be ensured that the user of the system is really the student that corresponds to that identity. A sole identification system would also solve the eventual struggle that students suffer from their identity being deleted from the host university system or getting their access codes erased, which prevents them from entering the system again after the exchange program is finished. eIDAS and ESC are two platforms that offer an innovative approach to a system of sole, electronic, digital and remote identification. Why should we consider developing a complete system like this one? Those platforms that need to verify and authorize the registration process of their users through the authentication of their identity, should be able to recognize their users as the data owners which they will need to have access to and manage. This means that the system must provide them with a safe and infallible access to the system so as to obtain only their corresponding data. A service that could generate a global authorization and identification would make all registration and authentication processes much easier and simpler. eID (a part of eIDAS) and ESC are providing a solution that approaches a global authorization and identification service. Hence, if developed correctly, it could truly become an indispensable element for the appropriate functioning of platforms that require such services. The Erasmus program has developed ERASMUS+ App, an application for mobile devices which provides their users (usually students and HEIs) with useful tools to carry out many different tasks. However, it has not been developed yet an app for mobile devices to allow their users to check, revise and manage all the information and data which students and HEIs need to handle. Neither has been developed a system to include the services offered by already existent platforms, such as EMREX, EWP or OLA, so that user can download official documents to their devices or even transfer their academic records and results from one institution to another one. The lack of these mobile solutions represents today a problem which needs to be solved, especially for all the systems which target students, who are the heavy users of mobile devices and carry out all kind of administrative tasks through their phones or other devices. As one can read above, EWP and EMREX projects are solely focused on working on the Exchange of students’ academic record certificates by transferring academic data and information electronically and digitally. However, a plan to automatically convert the grading sys-tem is on hold. This is the reason why EMREX (as it is specialized in the transfer of academic record certificates) is trying to join forces with EGRACONS and other platforms in order to develop a system which could offer a conversion grading service, altogether with everything that EMREX offers as a platform. A unique identification could be-come a key element to carry out different administrative and academic processes in different HEI digital platforms (home universities and abroad universities) for exchange students. In order to get a unique identity for all platforms, it would be necessary that every student could get a unique profile and authentication, registration and authorization key codes. eIDAS and ESC offer an approach to this idea of having a unique system of electronic, digital and remote identification. EMREX and EWP are studying different options to integrate their platforms with eIDAS’ and ESC’s because that is exactly the projects the latter are working on. The ERASMUS+ App is designed to help students, professors and administrative staff involved in exchange programs to obtain information and carry out different processes digitally and electronically from mobile devices. However, the app could be much more useful and functional. This is why EMREX has decided to offer their services through the ERASMUS+ App. Now, their services will be available for students, administrative staff and professors on their mobile devices. Even though the app users cannot manage or handle all the information and data that are required in all administrative processes via app or EWP’s and OLA’s services are not totally available, these platforms are working on it so that the app can become 100% functional in relation to these services. This way, users will be able to download official documents in their mobile devices or event create an electronic support network to unable safe, fast and simple transfers of academic data and information from one HEI to another. Carmen Diaz Carmen is a Product manager at Sigma AIE in Barcelona. As a product manager she’s responsible for the functional control of SIGMA Academic roadmap, leading improvements that enable a more competitive development of the Higher Education Area. She is also the task force leader for the Student mobility task force within Eunis.